Leicester Community Music School has been operating out of the music room at Leicester High School since October 2014, when we were generously given free access to two practice rooms during after-school hours on Mondays, Tuesdays, and Thursdays, but we have outgrown the space. It is difficult to operate comfortably in our current space with more than 24 students, and LCMS has had 30+ students since the spring of 2015. In order to continue to grow, we need a location of our own. We have secured a storefront location at 880 Pleasant St. in Rochdale, MA. 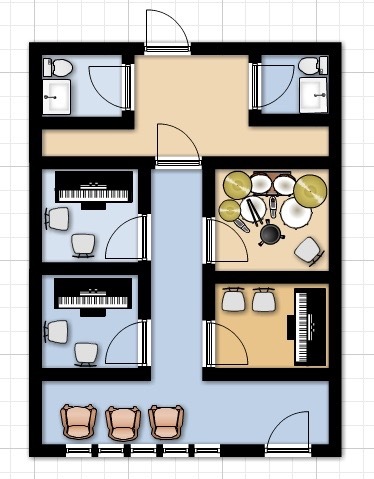 Our plan is to build four lesson studios and outfit the space with soundproofing material so as not to disturb the other businesses in the building. We hope to begin construction in May 2017 and be moved into the new location by June 2017. The original price estimate for this project is roughly $15,000. With our current students, we are able to afford the operating costs that we will face when moving to this new location, but we simply cannot afford the renovations without help. We are currently holding a fundraiser to raise $10,000 to help cover the costs of this renovation. Please contribute to our campaign. Most LCMS students receive a partial discount on the cost of their lessons. Our goal is to begin accepting students on full or partial scholarship by 2017. In order to do this, we need to have at least 40 students enrolled. Moving into our own space will make this possible by allowing us to have 4 lessons at one time while increasing our hours of operation.